While the book presents no definitive argument, Crifasi is skeptical of claims that water management in the West has been synonymous with concentrated power. Rather, his often meandering narrative suggests that water developed roughly along practical and evolutionary lines, with users and institutions responding logically to changing water needs. Most of the text centers on the period from Colorado’s 1858 Gold Rush to the early twentieth century. Heavy doses of environmental determinism appear throughout. Crifasi argues that failed adventures in ditchdigging and the need to move water across property lines pushed farmers to enlist the aid of the territory/state of Colorado to form water districts and employ water commissioners and state engineers to oversee water management. Shared need propelled farmers to pool their resources to form mutual irrigation companies. 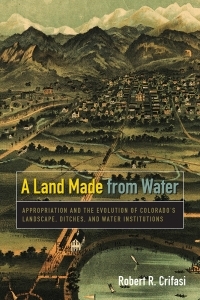 The evolution of Colorado’s Doctrine of Prior Appropriation was a commonsense response to shared need that enabled users to quantify and prioritize water rights as well as prevent property owners from hoarding the resource. In Crifasi’s telling, even corporate attempts to monopolize and privatize water in the late nineteenth century were a natural part of the region’s agricultural evolution since concentrated capital propelled the development of sophisticated canals that could bring uplands into production. One of Crifasi’s most intriguing, yet underdeveloped sections addresses water measurement and distribution. Employing William Cronon (Nature’s Metropolis, 1991), he argues that for water to be fairly distributed in an arid climate, it had to become a commodity that could be broken down into discrete measurable units. This meant water users had to translate malleable units such as the miner’s inch into standardized ones such as cubic feet per second. It also explains why users employed Colorado State Water Engineers to monitor stream measurements, water priority, and the carrying capacities of canals and ditches, as well as why the state agricultural college produced some of the nation’s first irrigation engineers. With a fine attention to detail, Crifasi then shows how water, once commodified, enabled irrigation companies to call for water releases based on their shareholders’ water rights, the priority of their holdings, and the availability of the resource. Within these strengths of the book lies two of its weaknesses. In making the commodification of water seem like an evolutionary process, Crifasi misses complex power relationships and historical contingencies. For example, although Crifasi explains how inventions such as the Parshall Flume vastly improved water measurement in the region, he overlooks how unevenly such innovations were installed into the irrigation landscape. Many irrigation companies did not want their water measured and so resisted new water technologies. This was especially true of those who held senior water rights and stood to lose if their water was measured. Moreover, state water officials and university-trained engineers were powerless to compel companies to upgrade aging water infrastructure. Resistance to new technologies was common from the early 1900s through the 1950s, a period dominated instead in Crifasi’s narrative by trans-mountain diversion projects that diverted Colorado River water to the Front Range.